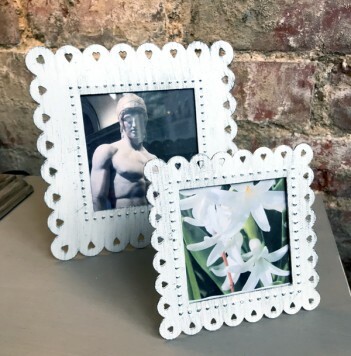 Available in two sizes these freestanding, metal frames have a punched heart design around the border. The larger frame measures 16.5 x 16.5cm, it has an aperture of 9x9cm and costs £8.50. Please note the information on the delivery page regarding sending items containing glass.